By Dan Ambrose: Irish middleweight contender Andy Lee (27-1, 19 KO’s) will be fighting on the Matthew Macklin vs. Sergio Martinez undercard against an opponent still to be determined on March 17th at Madison Square Garden, New York. Lee, 28, is hoping to face a high quality fighter so he can impress boxing fans at home and also keep getting pushed up the middleweight rankings. As of now, Lee is ranked #1 WBO, #2 WBA, #7 WBC. Despite being ranked high with the WBO and WBA, Lee still hasn’t gotten any bites as far as a world title shots. He wants to become the mandatory challenger for one of the champions so he can get a guaranteed shot at the title. In the past three fights, Lee has looked sharp in beating Craig McEwan, Alex Bunema and Brian Vera. The Vera fight was an important one for Lee, as he avenged a 7th round TKO loss he suffered against Vera from 2008. Lee showed good poise in the rematch and boxed tall, knocking Vera down in the 2nd and not punching himself out like he did in their first fight. Lee may have to put his career in overdrive because he’s still only ranked at #7 by the World Boxing Council and Chavez Jr. and his promoters at Top Rank likely won’t pick out a dangerous middleweight like Lee to fight, not when there are a lot of weaker contenders for Chavez Jr. to beat. Lee is too dangerous for his own good, and that means that he won’t be given a title shot against anyone and will instead have to wait until he becomes the mandatory challenger. Even that might not be enough to get a title shot if he hopes to fight against Chavez Jr. Unfortunately the only way Lee will get a title fight, other than becoming a mandatory, is for him to start looking more vulnerable. 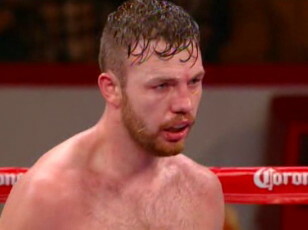 If he looks bad enough, he could end up getting picked by Chavez Jr. or someone like Geale. That guy still hasn’t fought anyone of quality.